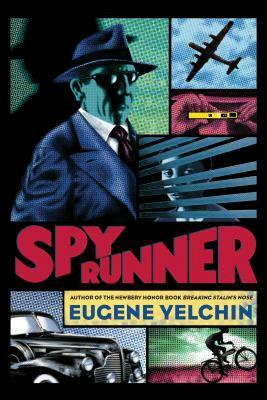 Spy Runner by Eugene Yelchin does an amazing job at introducing young readers to what life was like during the Cold War in America. Through Jake, a 12-year-old boy, readers are exposed to the propaganda, close-minded perspectives and prejudice against Russians that circulated among Americans in the 1950s. Jake believes himself to be a true patriot. In his mind being patriotic means uplifting the mantra that all Russians are communists, that communism means the end of America and many other negative beliefs. His thoughts are a natural result of his environment. However, he only becomes aware of other perspectives when his mother rents out a room in their house to a Russian which causes no end of trouble for Jake. As soon as Jake meets Shubin, their new housemate, he immediately despises him and believes him to be a Russian spy. On top of this belief, Jake idolizes the lives of spies and aims to become like the hero in his favourite comic “Spy Runner”. From spy movies to comics, media heavily influences Jake’s beliefs and enables him to make dangerous decisions. In an effort to expose Shubin for the Russian spy he believes him to be, Jake follows Shubin around and makes supposedly outrageous allegations. As the story progresses, readers are led to believe that there is a reasonable explanation for the incidents that Jake finds himself in and that the majority of his discoveries are in his head. Until, Jake ends up looking down the barrel of a gun. Needless to say, I thoroughly enjoyed reading this book. I won’t go into any more detail about it because I don’t want to give too much of the story away. However, the protagonist, like many boys his age, is inquisitive and allows his imagination to sometimes warp his reality which makes the book even more intense. The characters were well-developed and the plot’s progression had me hanging on to every sentence. My only issue with Spy Runner is that it’s supposed to be a novel with illustrations but the illustrations were so blurry and hard to identify that it was easier to skip over them than to try to understand what was happening in the image. Overall, I think Spy Runner is a book that any teacher, librarian or parent should insist on a young adult to read if they want to start a constructive discussion on politics, freedom of speech, and the media’s part in perpetuating a particular agenda.